"A great alternative to tech-heavy options because it’s modern and doesn’t look bulky on your wrist." "Rosehip seed oil that helps reduce fine lines, evens skin tone, reduce the appearance of stretch marks and adds moisture." "The voice-activated gadget allows your loved one to play music, make online orders, dim the lights or even call that cousin she’s been avoiding." "They focus on affordable luxury, selling sheets and bedding fit for a king, but at a much lower price than you might expect." "Ranging from red wine-infused salts to one mined in Sicily, the foodie in your life will love each of these 16 different flavors." "They can pressure cook, slow cook, saute, cook rice and even make yogurt." "The soy-based wax candle is 14.5 oz. and burns for about 25 to 45 hours." "The ultimate in audio quality, providing well-rounded sound for up to 40 hours per charge." "It looks like a sweater on the outside but has the warm fuzzy texture of fleece on the inside, so it can be worn as activewear or a bit more formal." Owners say the smartwatch is a great alternative to tech-heavy options because it’s modern and doesn’t look bulky on your wrist. 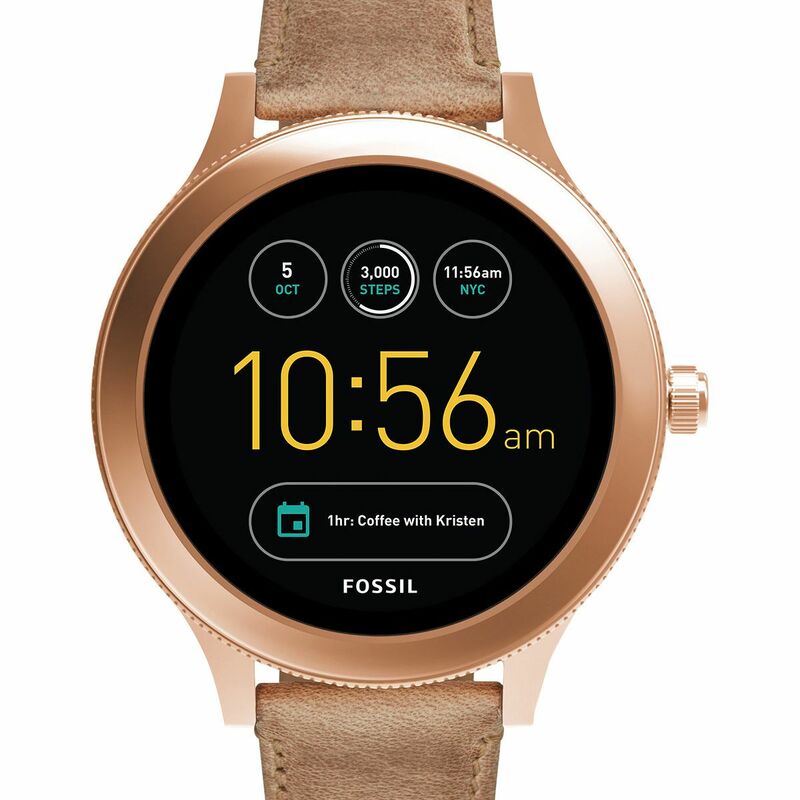 If your loved one covets a smartwatch but doesn’t want to sacrifice style, the Fossil Q Wander is a great choice. Beauty junkies and anyone who wants to look their best will flip over this rosehip seed oil that helps reduce fine lines, evens skin tone, reduce the appearance of stretch marks and adds moisture. Made from organic rosehip seed oil and that is it so you know it is pure. This product has over 3,000 reviews with 85% of them being 5-star. Reviewers see an improvement in their skin in an instant and love how well it performs at such a small price. As a gift, this would be a perfect addition to her beauty routine that she didn't know she needed. Make her house a home with the new Amazon Echo Dot. This smart home device is the best of the best and is sure to be the perfect addition to any busy household. The voice-activated gadget allows your loved one to play music, make online orders, dim the lights or even call that cousin she’s been avoiding, all without lifting a finger. We love the charcoal fabric because it works well with any aesthetic, but it also comes in heather gray and sandstone. If your leading lady needs help keeping track of all those soccer games and vet appointments, Amazon Echo is the perfect companion. With improved sound and a new design, there's nothing this device can't do. Brooklinen launched in 2014, and since then they’ve developed a massive following — and for good reason. They focus on affordable luxury, selling sheets and bedding fit for a king, but at a much lower price than you might expect. We love their Pure Virgin Wool Blanket in Greige as a great gift for any occasion. Handmade in Germany, the throw consists of high-quality lambswool — and comes with a 60-day risk-free trial, so if it’s not exactly how you imagined, you can return it. It’s 59" x 83", so it works well on a couch or a bed. Owners rave about the blanket’s softness and luxurious feel, stating that it keeps you warm without overheating. If you’re looking for a gift for that woman who has it all, the ​Brooklinen throw is a wonderful choice. Want to take a look at some other options? See our guide to the best throw blankets. Make food a little more fun for that special woman in your life with this Salts of the 7 Seas sampler. Ranging from red wine-infused salts to one mined in Sicily, the foodie in your life will love each of these 16 different flavors. Each comes in a 1/4 ounce container, which is enough for a handful of servings and tastings. These salts also make a lovely hostess gift for a friend or family member. Each salt has a distinctive flavor and texture, according to owners, and can transform a blah dish into a foodie’s dream. If you’re stuck on the perfect gift for that food lover in your life, this delicious gourmet salt sampler is just the thing. Instant Pots are all the rage these days. They can pressure cook, slow cook, saute, cook rice and even make yogurt. What is great about them is they are easy, so they are great for a budding chef or someone who is just learning how to cook. Available in three-quart, six-quart, six-quart plus and an eight-quart you can get her the model that fits her needs and kitchen space. What reviewers love about this is it replaces the need for all of your other appliances so it is a space saver. Some of the best presents are those that give your loved one the gift of relaxation. Show how much you appreciate her by reminding her to unwind and destress. This Bath & Body Works Eucalyptus Aromatherapy Stress Candle is the perfect gift for every occasion and every woman in your life. The soy-based wax candle is 14.5 oz, and burns for about 25 - 45 hours. Eucalyptus oil is known to reduce stress and increase mental energy, and we love the spearmint kick that gives this candle a sense of freshness and cleanliness. This is a great gift choice for a loved one on any occasion; it also makes a great gift for a teacher or a boss. Owners say the candle burns evenly and slowly, giving off hours and hours of low-key stress reduction. Take a look at other product reviews and shop for the best scented candles​ available online. If your loved one is still carrying around those broken earbuds, it’s time to give her a much-needed upgrade. The Beats Solo3 Wireless Headphones are the ultimate in audio quality, providing well-rounded sound for up to 40 hours per charge. The matte gold color is our favorite choice for the woman in your life, but these headphones also come in 13 different styles. The cushioned ear cups are designed with comfort in mind, perfect for long flights or commutes. The headphones also allow your loved one to answer calls and control their music using voice controls. Owners love the sound quality from the Beats Solo3 headphones, stating they sound better than much more expensive products, but with style that outshines all the competition. Give her something that will keep her warm on chilly winter nights, a nice toasty fleece! What we love about this is it looks like a sweater on the outside but has the warm fuzzy texture of a fleece on the inside, so it can be worn as activewear or a bit more formal. It comes in seven different hues and is slightly fitted so it is figure flattering. She can throw it on under her ski jacket when she hits the slopes or wear it while she walks the dog. No matter where — this will be her new go-to. Still can't decide on what you want? Our round-up of the best gifts from L.L Bean​ can help you find what you're looking for.